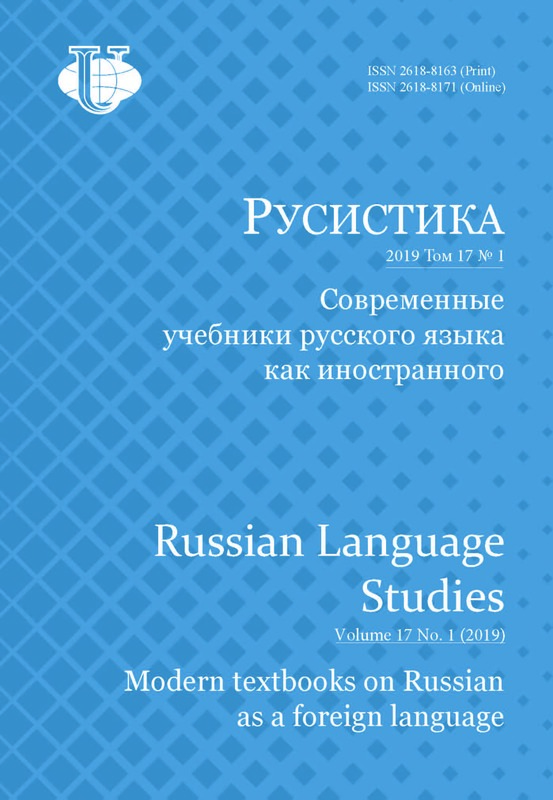 The article generalizes and gives critical analysis of the problems of a modern Russian as foreign language (RFL) textbook. Its essential characteristics and functions are revealed. A textbook on Russian as a foreign language reflects the features of Russian language teaching at a certain stage of science development. The important characteristic of all RFL textbooks is the ability to simulate pedagogical process, simplified and at the same time idealized, and to ensure the interaction between the teacher and students. A textbook on Russian as a foreign language structures foreign language material presentation, organizes gradual formation of speech skills and abilities. The textbook realizes the informational function as well. The motivating function of the textbook can be realized in the unity of its external and internal structure. The interrelation of “visual appeal” (paper, font, colourful illustrations, etc.) and clearly structured material presentation with the necessarily generalized and systematized information is presented in a textbook. Practical (communicative) orientation is the essential characteristic of RFL textbook. RFL textbooks realizes a differentiated approach to control and training, i.e. performs the controlling function. A brief description of different generations of textbooks is given. The analysis of scientific and educational literature allows to confirm methodological necessity of creating an encyclopedia for the authors of RFL textbooks. The encyclopedia could sum up fundamental research in teaching foreign languages and Russian as a foreign language. teaching Russian as a foreign language, Russian as a foreign language textbook, education system. Russian language textbook for foreigners is a consistent and cohesive, scientific and artistic text… M.N. Vyatutnev Instead of introduction “I am not a child, I live (do not live) in the country of the language I am studying, I do not have unique abilities, I am not among those 5 % of people having a phonematic ear. I am a perfectionist so I am afraid of making mistakes, no, I am afraid of… a foreign language breaking my natural worldview: natural language rules, intonation, not much beloved, but though quite understandable grammar. And I am not mentioning words (thesaurus, connotational and non-equivalent lexis that form my worldview, my mentality - that is everything that I learnt at my mother’s breast, from lullabies, sayings and fairy-tales). I am also very busy at work. But there are advantages - I finished school (so I am able to be taught), I am not deaf and do not have any problems with my vocal apparatus. That’s not bad! I want to speak, so I am motivated and interested. And that’s quite enough. I need an ideal textbook and a good teacher. Or a good textbook and an ideal teacher? Where is “the golden key” opening the door into the world of a foreign language?” Probably these are the questions that could arose before a person who began studying a foreign language. Let’s try to find out what a modern Russian as a foreign language (RFL) textbook should be. The aims The aim of the article is to generalize and give a critical insight into the problem of a modern RFL textbook. We also aim at substantiating linguomethodical necessity of creating an encyclopaedia (a reference book) for the authors of RFL textbooks. This encyclopaedia would systematize fundamental methodological research (A.R. Arutyunov, V.P. Bespalko, I.L. Bim, M.N. Vyatutnev, G.G. Gorodilova, D.D. Zuev, I.A. Zimnyaya, V.G. Kostomarov, O.D. Mitrofanova, M.V. Lyakhovitsky, A.A. Leontyev, E.I. Passov, A.N. Shchukin, etc.) in the sphere of teaching foreign languages, RFL, theory of a textbook; would present modern concepts in the theory of creating RFL textbook; would describe procedures of constructing and modelling “the main teaching aid - textbook in order to define its correspondence to subject specifics and finally facilitate its scientific optimization and optimization of educational system on the whole” (Bim, 1977: 3). Methods Among “methods of learning and studying reality” (Azimov, Shchukin, 1999: 38) the author has chosen combinations of research methods, complementing each other: analysis of scientific and educational literature, observation and generalization of 30 years of teaching experience. The chosen methods were used both on theoretical (comparison, analysis and synthesis, abstraction and modelling) and practical levels (observation, comparison). Results 1. On base of linguodidactic analysis of different (modern and traditional) RFL textbooks the author has generalized and characterized problems of a modern RFL textbook. 2. The author has revealed essential characteristics and functions of RFL textbook. Discussion Essential characteristics and functions of RFL textbook 1. A foreign language has a lot in common with practical disciplines: music, dance, sport. We need abilities (at least makings) that we do not always feel. We need knowledge - bases, orienting points leading to the learning aim. Knowledge is necessary, but it is not goal in and of itself, but only “road signs” of “driving lessons” or “crutches” (it is up to you to choose). Learn by heart, make a not, using mnemonics - everything that helps quick and firm memorising theoretical material (associations, rhythmic structures of rhymed texts, etc.). Associative links are sustainable slots for keeping knowledge, learning “values”. Deliberate and frequent repetition, speaking form a skill. Skill formation requires time depending on abilities, individual traits and students’ native language. It is necessary to form “actions at automatic level, sustainable, absence of element-by-element perception” (Azimov, Shchukin, 1999: 166). To perform the skill correctly (on the base of acquired knowledge) students need self-control, including not only “reproduction”, but “optimal decision in using the formed skills” (Azimov, Shchukin, 1999: 372), i.e. expertise. Expertise is effective and independent performance of an action with deep understanding of what is done. “The main component of learning material” (speech activity) is formed “at practically-oriented language lessons” (Shchukin, 2003: 132). A modern RFL textbook structures foreign language knowledge, organizes the process of phase-by-phase formation of speech skills and expertise in all kinds of speech activity. RFL textbook realizes, first of all, informational function. The chosen and effective tasks and exercises (on psychological base of acquisition) control the process of knowledge structuring, necessary for students’ language competence, formation of speech skills and expertise. In such a way, RFL textbook needs rules on language system and instructions how to use the system not only in theory, but also in practice. “Acquiring language system is not only cumulative activity, but also integration, combining parts into the whole. You cannot fully acquire any unit, any dose of language system without acquiring the system on the whole” (Vyatutnev, 1984: 34). 2. We have landmarks (knowledge!). We can “walk”, i.e. act automatically and deliberately. The race is got by running. The fastest are not always the first. It is usually the most motivated who are the first. The best dancers, musicians, sportsmen, translators, teachers are those who love what they do. And can you love what you cannot do yet? Probably, only interest to the subject (to the language) can give rise to love. Expectancy, possibility of love… It can be mutual or not. How can you be successful in relations with a foreign language? Attention to details (actually there are no irrelevant details in a language), care (about correct pronunciation, grammar forms, intonation, syntagmas, etc. ), constant self-reminding (you reap what you sow; maximum force and time), communication and positive attitude (to a foreign language and in a foreign language). The formula is simple: motivation, abilities, interest, actions and achievements lead to success. One solved problem motivates to a new step, new achievement. Schemes, tables, etc. - everything that help better memorizing - has to be presented in a modern RFL textbook. Forming strategic (compensatory) competence is the main task of teaching a foreign language. Motivating function of a textbook can be realized in the unity of its internal and external structure. The correlation between “visual appeal” of a textbook (paper, font, colourful illustrations, etc.) and distinct structured presentation of the material with necessary generalization and systematization of the information. A textbook which is pleasant to hold in hands, interesting to read, easy to learn can never be forgotten. “The aim of a textbook is not to be an immobile logical scheme of ready-made knowledge for delivery or archives of foreign language material for general acquisition, but a comprehensive program of academic work… aimed at acquiring foreign language practical (communicative) activity…” (Bim, 1997: 266). A good textbook can be a “golden key” opening the door into a new language and a new culture. Among such textbooks are “Russian for everybody” (Stepanova, 1978), which brought its authors State Prize of the USSR in 1980; the study pack for schoolchildren “Horizon-1” (Vyatutnev, etc., 1977), the study pack for preparatory faculties “Start” (Galeeva, etc., 1979), the most beloved manual “Russian in exercises” (Khavronina, Shirochenskaya, 2013) which has been published more than 70 times in 20 languages, and many others. 3. A foreign language is a one whole organism, where each part defines the general life activity. Acquiring a foreign language (to a less extent) is a positive transferal of skills (transposition) from the system of native (or the first foreign language) and (to a greater degree) acquiring a new system (overcoming native language interference). Language aspects (phonetics, lexis, grammar, linguistic and cultural studies/cultural linguistics) are inseparably associated and consistent. The main task in learning a foreign language is to combine separate sounds into words, then add a meaning to the sound complex. In a foreign language word sound and meaning have to become one whole as in the native language. Grammar (though it is very difficult in Russian) assists in learning a foreign language, systematizes and structures it. Grammar is a kind of “price” for the pleasure to speak a foreign language. Neglecting one of language aspects in RFL textbook causes serious problems in learning a language. Formation and development of skills are carried out consistently in different kinds of speech activity; the transferral of skills between these kinds can happen in case of patience in learning and students’ systematic individual work. An RFL textbook should contain differentiated (according to their difficulty) preparatory tasks and exercises, necessary to form speech competence, ranged creative (speech) exercises as “a means of acquiring speech activity in its different kinds” (Shchukin, 2003: 132). All kinds of speech activity (receptive and productive) are interrelated and interconnected, none of them can be “expelled” of the lesson, because an idea can be said, read, written and heard, the main thing in communication is to understand and to be understood. Modern RFL textbooks (as a rule) present cultural information. Information about culture and traditions of the country of the foreign language help to understand speech behavior of the language speakers in a situation of real communication which is important for acquiring intercultural communication and formation of sociocultural competence. New time means new rules! All modern scientific ideas of methodology (and its basic sciences) are reflected in RFL manuals. It is interesting to trace the peculiarities of teaching Russian at a certain stage development of methodology of teaching RFL; compare textbooks of one/different methodological directions; find out the specifics and similarities in the structure of modern RFL textbooks. These are the tasks that could be solved in further research. In such a way, a textbook as “the main teaching aid… contains samples of oral and written speech, language material, chosen and organized considering its functions in different forms of communication in types of speech activity and also positive students’ experience in their native languages and preventing interference” (Azimov, Shchukin, 1999: 383). 4. Students’ individual traits and psychological characteristics define their possibilities in memorizing theoretical material and strengthening their skills at practice. Will helps to overcome difficulties, learn, strengthen, use the received knowledge. In learning a foreign language repetition plays a great role. Practice is the best master (remember step-by-step reminding - “spaced repetition” by P. Pimsleur and “forgetting curve” by G. Ebbinghaus). The success depends on the student (the subject of learning activities), teacher and the chosen textbook. In 1970s there have been conducted researches aimed at “combining learning models (the fact that is defined by the teacher and student) and what the student introduces into the process”, i.e. “individualization principle”, considering “language abilities, motivations and students’ interests” (Gorodilova, 1971). So a textbook supposes explanation, training and revising the educational material (differentiated and ranged according to their difficulty) basing on all types of memory (visual, aural, motor), because there can be students with different types of memory. Tasks on logical memory are welcomed. A substantial feature of RFL textbook is the ability to model a teaching process ensuring the interaction between the teacher and students. Textbook contents cannot be fully acquired by all students with equal volume and quality. One group finds the material too difficult and excessive, the other would consider it easy and insufficient. Theoretical knowledge and its transition into skills and expertise are tested and corrected in a complex communication act. Communicative method in teaching RFL supposes that textbooks and manuals lead the student from the theory to practice (and vice versa) on base of a series of communicative exercises where practical tasks are ensured by sufficient theoretical knowledge. The main characteristics of RFL textbook is its practical (communicative) focus: “We prove universality of communicative contents included into the textbook, because it is defined by the very nature of communication, system of modern Russian literary language, aims and communicative needs of students” (Vyatutnev, 1984: 4). 5. Student - textbook - teacher. This is the most important triad conditioning success in teaching a foreign language, its acquisition and mastering. Different cognitive strategies of students in the process of learning material acquisition and of the teacher in the teaching process (delivery of their experience and knowledge to students) could be compensated with the help of a correct textbook. “For a student learning material is presented by the teacher and a textbook… the disadvantages of one could be to a certain extent compensated by the advantages of the other, although… the role of the teacher is naturally dominating” (Bim, 1977: 244). A good (i.e. relevant for a certain student) method is proposed by the teacher (who is also a subject of the learning process) and is defined in a certain textbook. “Improving textbooks… of a communicative type would approach the teaching technology to individual acquisition strategy” (Vyatutnev, 1984: 132). In such a way, a textbook is like a bridge between two creative subjects - a teacher and a student. A task that is too easy or too difficult, according to L.S. Vygotsky, slowdowns language acquisition. A textbook overloaded with information, theory, difficult tasks interferes with learning. Extra efforts, overwork would be pointless: will also has its limit for every day. A student who wants to study a language (correct presupposition, motivation), teacher, intelligent and creative, and a good textbook are the components of success. A motivated student, a good teacher and a good textbook are not a sum, but synergy (their combined activity is more than a sum of their actions). 6. Teaching a foreign language is a “closed assessment/control system” and teaching; systematization of knowledge. Test tasks and systematic control refine the quality of teaching and motivate students. “Different levels of development and cognitive abilities of the students show the necessity of differentiated approach to teaching, including control” (Shchukin, 2003: 280). An RFL textbook, on the one side, organizes the teaching process, and on the other - adapts the material to certain students, real educational process (diagnoses, teaches, controls). Differentiated approach to teaching and control should be reflected in modern RFL textbooks, in this case we can speak about controlling function of a modern textbook. 7. A foreign language is a new language and cultural code, “baggage” which is not reclaimed, but is acquired in the process of persistent learning (in the process of communication). It is very good if the author of the textbook can say about it: “Study packs ‘Russian Language - 1, 2, 3’ and ‘Horizon-1’ not only formed foreign students’ communicative knowledge and skills, but also gave information” about the country, peoples’ way of life, “its cultural and scientific achievements” (Vyatutnev, 1984: 21). Nowadays it is important that an RFL textbook could oppose negative views about Russia and the Russian language, form a positive image of the country. In our opinion, a modern textbook has to contain not only linguistic, but also extralinguistic, cultural information to form sociocultural competence as a component of communicative one. 8. Learning a foreign language means forming language experience and language “instinct” natural for native language. Speaking a native language you do not always understand, but feel the mistake. Language experience is connected with communication, with the “life” of language in all its spheres. Language experience is necessary to form pragmatic, discursive and social competence. “The contents of communicative manuals adequately reflects the nature of communication, and that is why it is universal. The differences can be only quantitative, considering communicative needs of students, educational environment, students in a group” (Vyatutnev, 1984: 135). To form a language “instinct” the authors of RFL textbooks and manuals propose problem tasks, analysis of new language difficulties and speech constructions on base of the learned material. Forming communicative competence (on base of other competences) is the most important of modern RFL textbook. Summing it up, we can point out the following functions of a textbook: - informative (acquiring a language and getting acquainted with the peoples’ culture); - motivating (interest to study the Russian language); - communicative (practical activity); - controlling (diagnostic, current and final check, forming the students’ correcting and self-correcting skills in the learning process). Generations of RFL textbooks In methods of teaching RFL we can define several stages of development with different aims, contents, methods and teaching aids. So we can also define several generations of RFL textbooks. 1. 1920-1940s. At this time principles of creating textbooks and manuals are formulated. The following books are popular: N.S. Derzhavin “Textbook on Russian Grammar” (1923), “Little Grammar” (1918), A.M. Peshkovsky “Our Language” (1923). “Methodical romanticism… in the middle of 1930s changed into… realistic approach to methodical problems” (Bakhtiyarova, Shchukin, 1988: 32). There is an argument between the supporters of observation and experiments in the sphere of the language (S.I. Abakumov, P.O. Afanasyev, N.S. Derzhavin, etc.) and the supporters of systematic, structured teaching of a language (A.M. Peshkovsky, A.B. Shapiro, etc.). Many famous scientists of that time spoke about “the death”, “irrelevance” of a textbook itself: knowledge cannot be presented as ready-made, but should be achieved independently in the process of observation on language phenomena. In teaching “workbooks” and “brochures” were actual. A.M. Peshkovsky made a stand for a textbook with systematic Russian language course. The textbook was rescued! There appeared nationally oriented textbooks by A.I. Smirnitsky, P.P. Sveshnikov “Russian language textbook. Elementary course” (1935) for English speakers and N.F. Potapova “The Russian language. For French speakers” (1936). 2. In 1945-1959 RFL textbooks realized a concept oriented not only on acquiring language system, but also on speaking, for example, N.F. Potapova’s textbook “Russian” for English speakers (1945). In 1947 there was published “Short reference book on Russian grammar” by I.M. Pulkina, in 1955 - “Russian language textbook for foreign students” by I.M. Pulkina and E.B. Zakhava-Nekrasova with detailed theoretical information and practical tasks and with cyclic system of material presentation. This year also saw I.M. Pulkina and G.I. Rozhkova’s “Exercise book on the Russian language” which focuses on the difficulties of the Russian language for foreigners. Special “view” (G.I. Rozhkova’s term) of Russian grammar from the position of a foreign student is actual even nowadays. 3. In 1960-1969 “there were published different textbooks and manuals for different categories of students” (Bakhtiyarova, Shchukin, 1988: 67). Comparative grammar of two languages predicts possible interference, exercises for a certain group of students were worked out. There appeared Russian language textbooks for English (Vagner, Ovsienko, 1967), French (Vaneeva, Vishnyakova, Ostapenko, 1965) and German speakers (ZakhaevaNekrasova, Rassudova, etc., 1964). In 1965 teachers of Moscow State University wrote a Russian language textbook for preparatory faculties aimed at practical language acquisition as a means of communication. 4. 1970-1979s - rapid development of methods of teaching Russian as a foreign language, rising interest to the theory of a textbook, defining main types of textbooks for foreigners (Problems of a textbook…, 1977). Textbook is called the main means of education in the structure of a typical study pack. There were written study packs for different levels and specialties (universal and nationally oriented). Edited by G.I. Volodina “Practical course of the Russian language” for foreigners studying natural sciences was very popular. Communicative concept of learning languages is realized in famous and popular textbooks “Russian for everybody” (1978), “Start” (1979), “Horizon-1” (1977). 5. 1980-1990s - differentiated learning according to individual activity and communicative activity approaches in teaching Russian as a foreign language (Zimnyaya, 1985: 49). “Textbook theory… point out language, speech, communicative and behavioural, communicative and activity textbooks on the Russian language. The second classification …where textbook is defined as a model of a teaching method… point out grammar and translation, consciously-practical, communicative, intensive” textbooks on RFL (Bakhtiyarova, Shchukin, 1988: 131). 6. 1990-2000s - teaching a language not only as comprehensive discipline, but also as “using in real life situations and functions” (Shchukin, 2003: 298). The scientists characterize communication, speech acts, speech intentions, speech models, speech operations and the final aim of teaching a language - communicative competence, study interaction of language and culture, “linguistic worldview”, “secondary linguistic identity”. There were described language levels, worked out state educational standards (1999), typical tests for different levels. Textbooks and manuals are oriented at state standards and level system of language acquisition. 7. 2000s - mastering electronic educational environment, using innovation technologies in teaching foreign languages, the theory of mixed learning, electronic textbooks, etc. More than 20 electronic textbooks appeared, “the most popular were ‘Cabbage’ (Finland), ‘Ruslan’ (Great Britain), ‘Russian from the very beginning’ (Russia), ‘Voices’ (the USA), ‘Kraski’ (Italy). In Russia there were created electronic textbooks ‘Vladimir’ (2003), ‘News from Russia’ (2006), ‘Russian with computer. Step 1’ (2006), etc.” (Nizovaya, 2012: 50). Problems 1. Different authors of textbooks basing on general methods of teaching foreign languages (and its basic sciences) structure the material in their own way. There is no agreement on the question “if there are specific problems of a textbook or a textbook realizes methodical system of its authors… in this case there will be as many “theories” of a textbook as many authors of textbooks are” or a textbook “should have its own features independent of methodical systems of different authors” (Vyatutnev, 1984: 151). 2. On the one hand, the theory of RFL textbook is connected to modern theoretical questions of methods of teaching foreign languages and allied sciences (linguistics, pedagogy, psychology, etc.). On the other hand, talented authors create their textbooks and manuals breaking common rules. For example, D. Rowland, the manager of the project on writing textbooks on foreign languages (French, German, Russian and Spanish) (Rowland, 1972: 80) wrote: “We were happy that at the beginning of our project we were not bounded by any theory of language acquisition or any teaching method. In this way, at the same time we could be eclectics and pragmatics, choosing and testing the things that seemed relevant or appropriate for our aims and declining everything irrelevant”. What should be general (invariant) for all the authors of textbooks and what could be changeable (variable)? 3. The absence of continuity in textbooks and manuals for different levels and also the absence of general concept of the series of RFL textbooks. 4. Lack of differentiated tests and control papers important for quick feedback and “closed system” of teaching and control, correction and self-correction. 5. Inadequate attention to the motivation to learning the Russian language. 6. The absence of standardised criteria for assessing a modern textbooks. 7. Mastering internet environment, creating electronic textbooks requires scientific analysis of the theory of textbooks, including electronic ones, their typology, classification, etc. Conclusion There is a methodical necessity in creating an encyclopaedia (reference books) for the authors of RFL textbooks systematizing fundamental methodological research in the sphere of teaching foreign languages, RFL, presenting modern concepts in the theory of creating RFL textbooks, describing procedures of their constructing and modelling. Pul’kina, I.M., & Rozhkova, G.I. (1955). Sbornik grammaticheskikh uprazhnenii po russkomu yazyku [Collection of grammar exercises in Russian]. Moscow: Moskovskii universitet Publ. (In Russ.) Rowland D. (1972). Toward FLES in Britain. Part II. The Modern Language Journal, LVI, (2), 80. Copyright (c) 2018 Pashkovskaya S.S.